Urantia Foundation is excited to announce that we have started an Instagram account! You can see daily posts of the goings-on in our office in Chicago and worldwide. 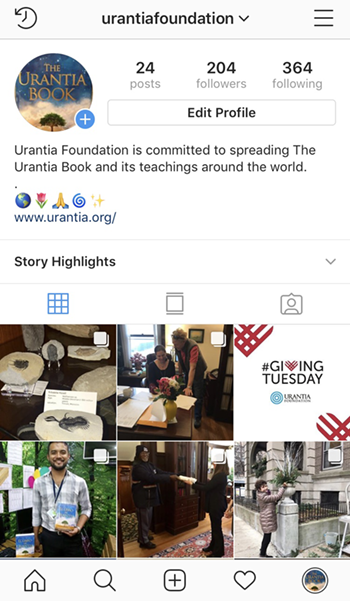 With increased activity among Urantia Book readers around the globe, Instagram allows us to stay connected. Instagram is a social networking app made for sharing photos and videos. It is available for free on iOS and Android devices—simply download the app and create an account. It can also be accessed on the web from a computer. When you post a photo or video on Instagram, it will be displayed on your profile. Other users who follow you will see your posts in their own feed. Likewise, you'll see posts from other users whom you choose to follow. It's the perfect way to engage with your community! Follow @urantiafoundation instagram.com/urantiafoundation/ and encourage your friends to follow us and help us further seed The Urantia Book and its teachings around the world.